Events affecting Iran, prompted by the May 8 decision of US President Donald Trump to withdraw America from a 2015 nuclear deal, may appear irrelevant to Caribbean countries. They are not. One of the first effects will be a rise in oil prices, which has already reached US$77 a barrel and is forecast to rise higher. The cost of oil is one of the highest factor costs for production in every Caribbean Community (CARICOM) country, except Trinidad and Tobago, which is an oil and gas producer. Since 2014, Caribbean economies enjoyed a respite from high oil prices that averaged US$100 a barrel over the previous six years, pushing up the cost-of-living and adversely affecting the region’s capacity to compete globally, including in tourism. At an average cost of US$50 a barrel for oil, Caribbean economies did better. Almost all of them showed signs of recovery and economic growth in 2016 and 2017. However, if oil prices continue to increase in the wake of decreased capacity of Iran to sell its oil, Caribbean economies will be adversely affected, particularly as the Oil Producing Exporting Countries (OPEC), especially Saudi Arabia, have decided to cut back their production to force their revenues upwards. The price of oil is not the only area that will affect the Caribbean, after President Trump’s decision to withdraw the US from the Joint Comprehensive Plan of Action (JCPOA) with Iran, which was negotiated and signed in 2015 by the US, Britain, France, Russia and China (the five permanent members of the UN Security Council) plus Germany. 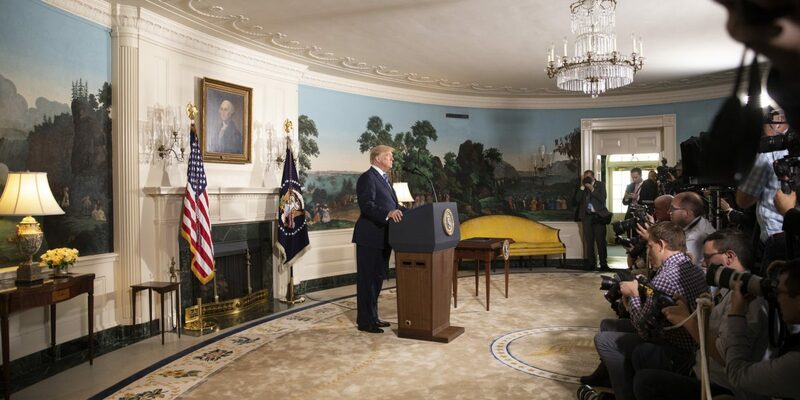 In announcing his decision to withdraw the US from the agreement, President Trump also ominously declared: “Any nation that helps Iran in its quest for nuclear weapons could also be strongly sanctioned by the United States.” Exactly, how “helps” is defined is unclear. Caribbean countries certainly have no desire to see any country develop or expand its nuclear capacity and nuclear weapons that pose a threat to the existence of all mankind. But, things, such as a ship, which is registered in the Caribbean and sailing under the flag of a Caribbean country, carrying oil from Iran or delivering goods to Iran, could be interpreted as “help”. In such a case, the Caribbean country concerned could attract sanctions. Similarly, bank transactions involving payments to and from the Iranian government or companies in Iran could equally be construed as “help”. Of course, the Caribbean region is not the only area of the world to which this situation applies. The countries of the European Union are particularly vulnerable to President Trump’s announcement. Major European companies could see billions of dollars in commercial deals canceled because of the US decision to re-impose sanctions. From the US standpoint, there are no commercial interests to be protected with Iran. Indeed, trade between the US and Iran is far less than trade with Antigua and Barbuda, one of the small Caribbean countries. The US balance of trade surplus with Iran was a mere US$74.5 million in 2017; its surplus with Antigua and Barbuda was US$413.5 million. Mr Trump remained unconvinced that the Iran agreement was anything but a “bad deal”. This claim is criticized by his Democratic Party opponents, such as Susan Rice the former national security adviser in President Barack Obama’s administration. She wrote that because Trump is “disdainful of any success of his predecessor”, he “has long been determined to destroy this agreement”. President Trump also referred to this Israeli discovery, declaring: “Last week, Israel published intelligence documents long concealed by Iran, conclusively showing the Iranian regime and its history of pursuing nuclear weapons.” However, experts have attested that the Israeli “intelligence documents” related to a time preceding the 2015 agreement. The day after President Trump’s announcement, Yukiya Amano, the director-general of the International Atomic Energy Agency, which has been monitoring Iran’s compliance with the JCPOA, confirmed that “the nuclear-related commitments are being implemented by Iran”. There is one other concern for Caribbean countries and all other small states. The JCPOA was adopted by a Resolution of the UN Security Council. That makes it binding international law and renders the US government’s decision to abandon it unilaterally, a violation. Since small countries rely on respect for international law as the primary source of their defence, the abrogation of it by any country, with impunity, makes them all more vulnerable than they already are. In the meantime, the prospect for greater conflict and instability in the Middle East has now escalated. Two days after President Trump’s withdrawal from the Iran deal, the Israeli military bombed dozens of Iran-linked military facilities in Syria. Israel claimed that the bombing was in response to missile strikes directed at Israeli territory – all of them apparently intercepted – that Israel blamed on Iran. So, conflict has intensified, and the Iranian government might decide that, in the absence of the JCPOA, “the handcuffs are off”, leaving it free to support Syria, and anti-Israeli elements. Regrettably, that prospect is real, making the world a lot less safe today.